Chuck Liddell and Dan Henderson debuted at UFC 17, giving the company a double dose of future greatness at one of its “dark ages” pay-per-views. UFC 17 took place on May 15, 1998, at the Mobile (Ala.) Civic Center. The theme was “Redemption,” as former UFC heavyweight champion Mark Coleman was scheduled to face Randy Couture in an attempt to regain the crown that he lost to Maurice Smith. However, Couture was unable to compete due to an injury. Coleman lost to his replacement, Lion’s Den fighter Pete Williams, on a head-kick knockout. 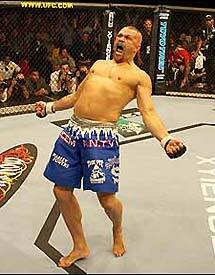 Liddell, the “Iceman” who would become a UFC legend, made his MMA debut by defeating Noe Hernandez by unanimous decision. Henderson won a four-man middleweight tournament by defeating Allan Goes by unanimous decision in the semifinals and Carlos Newton on a split decision in the finals. Tank Abbott improved his UFC record to 7-6 by defeating Hugo Duarte by TKO in 43 seconds. In the main event, Frank Shamrock continued his dominant run as UFC middleweight champion. He defeated Jeremy Horn by submission to a kneebar at 16:28. Don’t cry for Horn, though, because he racked up an amazing 91 wins in his MMA career.